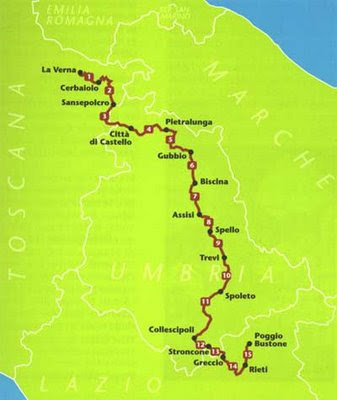 "...I'm going to start for the Via di Francesco a route in central Italy that run the historical sites where St. Francis lived. It begins in Tuscany-Sanctuary of la Verna cross Umbria (Città di Castello, Gubbio, Assisi, Spello, Spoleto, etc.) and ends in the forest of Poggio Bustone in Lathium. The path run through the forest, mountains and crosses medieval villages. It is a very spiritual camino with few people. I'll sleep in the convents or parish. The camino takes 16 days and is 350 km total. It is not long but harder than the camino the Santiago, at least that's what was written in my guide..."
Here's the route (in Italian) she will be taking for her pilgrimage for St. Francis. I wish her a good pilgrimage and is secretly jealous that she is starting her second camino so soon after Santiago. Hopefully when she is back she can share her experience on her Camino de San Francisco. Hello - Thank you for your great blog. I am interested in doing a pilgrimage like the one your friend Rosalinda was doing along the St. Francis routes in Italy. Do you know if there are books, websites, or resources that tell more about her route? Rosalinda mailed me a guide on this route (in Italian). When Peter (another German pilgrim) was in Singapore, I handed him the guide as he wanted to walk this and had no problems reading Italian. From what I know there are currently no English guide. This route is tough, as you can see from Rosalinda's comments. Accommodation can be expensive as there are no proper albergue system there (not a problem for my German friend). If you don't mind a guide in Italian, let me know. I can ask her if she can recommend one. Okay, thanks. I don't speak Italian, so I'll keep researching.